This stunning Happy Anniversary Car Bow is the perfect way to present your vehicle as a gift to a loved one. Dress up your car in style and make a great impression when you present your gift. A new addition to our store, the Happy Anniversary Car Bow is the perfect way to present a car when you give it away as a gift. Make your gift really special by adding a message to your car bow that will make someone’s day. Available in 3 bold colors, this stylish, elegant, but durable giant car bow attaches magnetically to avoid any scratches, and it is made from tough vinyl so it can be used indoors, outdoors, or wherever you want. Why Choose the Happy Anniversary Car Bow? 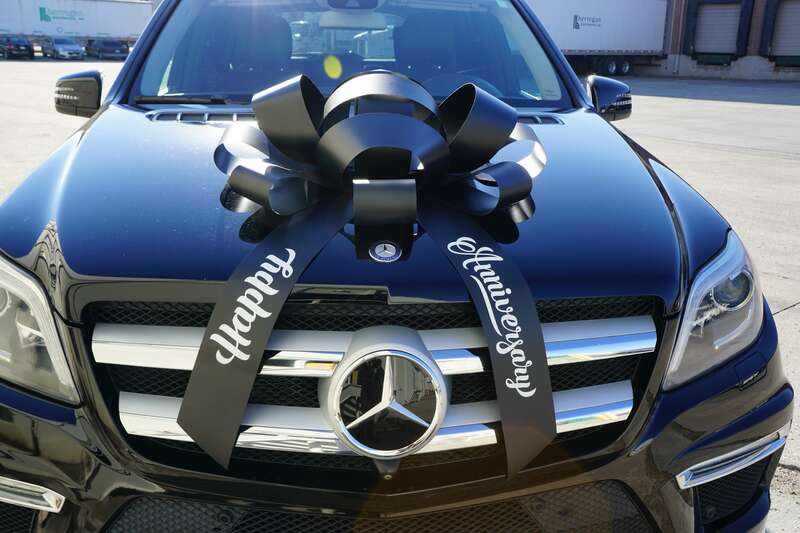 The 30” Happy Anniversary Car Bow is the perfect way to present a gift to a loved one to mark a birthday, graduation, or another special occasion. The Happy Anniversary Car Bow is available in Red, Black and White, and we also sell a wide range of other car bows with different messages. See our Graduation Car Bow, Happy Holidays Car Bow, Surprise Car Bow, and Big Red Car Bow. We even provide Customized Car Bows for your own unique message.